An American appeals court has granted a request by the Bush administration to delay the release of a US citizen held over an alleged al-Qaeda plot. The court ruled that Jose Padilla, arrested in 2002 for allegedly trying to set off a "dirty bomb", must stay in custody pending a government appeal. Mr Padilla is being held as an enemy combatant in a military jail. A lower court ruled last month that as he was a US citizen seized on US soil, he could not be held indefinitely. The administration says Mr Padilla's detention is necessary for US security. He was arrested at Chicago airport and accused of involvement in a plot to set off a radiological weapon. 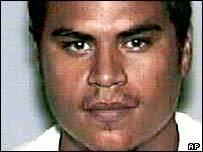 Mr Padilla has been held in a naval facility in Charleston, South Carolina, since June 2002, a month after his arrest. He has been unable to meet defence lawyers or challenge his detention because he is regarded as a threat to national security. He is thought to be the only US citizen since World War II to be detained on a presidential order. Last month, a federal appeal court ruled that President George W Bush did not have the authority to hold him in military custody indefinitely. The court said that, although it recognised that the US Government had a responsibility to protect the nation, presidential authority "does not exist in a vacuum". The judges said Mr Padilla should be released from military custody within 30 days, but added that the US Government was free to transfer him to civilian jurisdiction.